We’re super excited to announce the new version of secureSWF. We finally went the extra mile and completely ditched AIR SDK for repacking and resigning protected AIR files. With secureSWF v4.5, protecting AIR and APK files is just as straightforward as regular SWF files. If you still have your update plan running, this release is completely free of charge! Eliminated the need for Flex or AIR SDKs. secureSWF can now sign AIR and APK files all by itself. Internal certificate for signing AIR and APK files when none is provided. Generate AIRI from AIR files and vice versa. Ability to protect native desktop AIR apps. Protection options have been enhanced to crash all the latest decompilers. Packages, classes, and non-private members are excluded from renaming in SWC files by default. 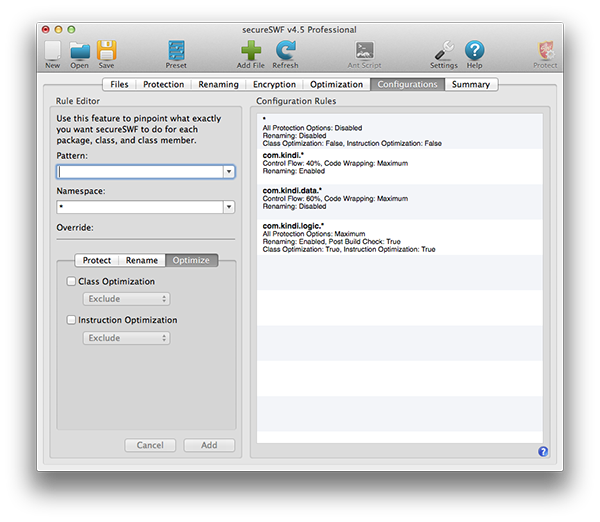 Export to Ant now generates separate rules for protection options and renaming options. Fixed inconsistent results when protecting with GUI and then exporting to Ant. OS X 10.9 and Windows 8.1 support. Fixed retention of save each file as in Windows. Fixed relative path issues on Mac. Rules list in the configuration options tab got redesigned. Added search for literal strings. GUI now saves maximized state. Fixed finding main SWF file in AIR and APK apps containing spaces in their names. Export to Ant utility now saves the latest used location. Fixed “Unable to parse the engine output” issue. Added ability to activate secureSWF from Ant. Fixed applying renaming values in configuration rules. Fixed all reported crashes which we were able to regenerate. This entry was posted in secureSWF Updates and tagged AIR, APK, v4.5. Bookmark the permalink.